USPA NEWS - New York Fashion Week powered by Art Hearts Fashion looked very sharp and unique this year. The show took place at the captivating and out-of-this-world Angel Orensanz Event Space in New York City from September 6th – 10th. Everyone was invited to admire one of the most state-of-the-art and imaginative fashion shows in the world. All models were glamorous sparkling stars walking through a heavenly corridor designed for earthly goddesses. ..
USPA NEWS - New York Fashion Week powered by Art Hearts Fashion took place at the spectacular Angel Orensanz Event Space from September 6th – 10th. This marvelous spectacle is held in New York City every February and September. 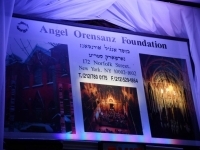 USPA NEWS - Despite the appearance and location of the monument, a mid-19th century Neo-Gothic Jewish Synagogue, located at 172 Norfolk Street, Lower East Side, Angel Orensanz, without a doubt, was engaged in creating a new initiative to reform and restore this place forgotten by time. Some say that "this building is a replica of the Sistine Chapel in Rome and the very temple of Solomon."